Please, turn off your antivirus. It may cause problems during the installation. If you have any problems with program updates, please, unpack this archive to your installation root. The beginners always want to know if there is a convenient tool for writing scripts and mods for Minecraft Pocket Edition. Even professional scripters are always in look for the best integrated development environment to work with. So we decided to write the best IDE for InnerCore, ModPE and CoreEngine!!! Simplicity. NIDE allows to easily write and edit code due to the best features of Autocomplete menu, Syntax highlighting and Real-time code validation. Speed. Lots of functions and API’s are already written for you in the form of numerous libraries, so you shouldn’t reinvent the wheel each time you start developing your mod. Also you can create and use custom libraries to make your code more readable. Quality. You will find almost no bugs in the NIDE as it is tested on the development of our own mod, APO Craft, and we fix all found faults immediately. Visualisation. Many processes of development are visualized. 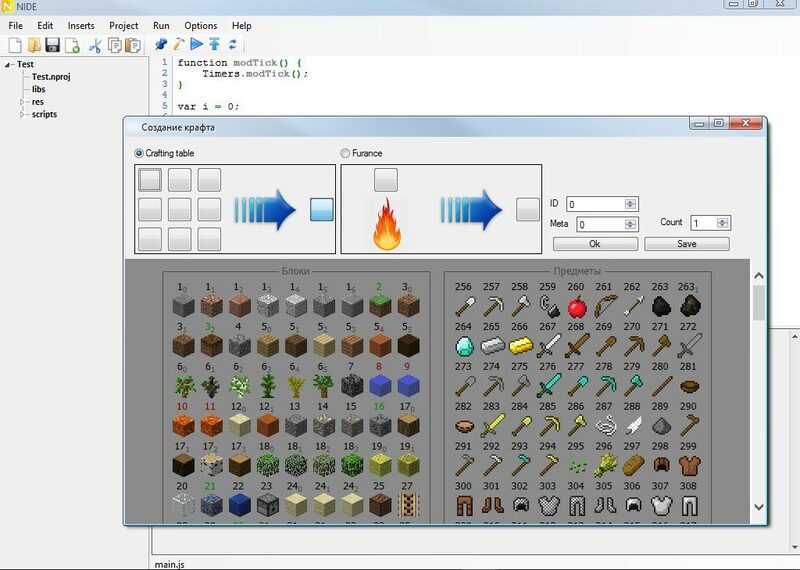 For example, you can easily create craft recipes using Craft recipes designer. Support. We are always ready to answer all your questions and examine all your issues with NIDE since the popularity of our IDE depends on its quality. Versatility. This program is convenient for both scripts and modpacks. One of the best features of NIDE is InnerCore and CoreEngine support, and a powerful shell for ModPE with its own API. Sending files to the device via ADB, automatic starting appropriate app and tracking InnerCore logs. So this program can be used by both beginners and professionals as it has all needed for the best coding experience ever!